A reactive system is one in which every stimulus (discrete change or event) triggers an immediate response within the next system cycle. That is to say, there is no latency between stimulus and response. Algorithmic software systems are only partially reactive. Even though an operation in an algorithmic sequence reacts immediately to the execution of the preceding operation, it often happens that a variable is changed in one part of the system but the change is not sensed (by calling a comparison operation) until later. In other words, in an algorithmic program, there is no consistent, deterministic causal link between a stimulus and its response. Algorithmic systems place a critical burden on the programmer because he or she has to remember to manually add code (usually a call to a subroutine) to deal with a changed variable. If an application is complex or if the programmer is not familiar with the code, the probability that a modification will introduce an unforeseen side effect (bug) is much higher. Sometimes, even if the programmer remembers to add code to handle the change, it may be too late. I call blind code any portion of an application that does not get automatically and immediately notified of a relevant change in a variable. Potential problems due to the blind code problem are so hard to assess and can have such catastrophic effects that many system managers would rather find alternative ways around a deficiency than modify the code, if at all possible. The way to cure blind code is to adopt a reactive, non-algorithmic software model. In a reactive programming system, a change in a variable is sensed as it happens and, if necessary, a signal is broadcast to every part of the system that depends on the change. It turns out that the development tools can automatically link sensors and effectors at design time so as to eliminate blind code altogether. See Automatic Elimination of Blind Code in Project COSA for more info on the use of sensor/effector association for blind code elimination. The synchronous reactive software model is the future of parallel computing. It enforces temporal determinism and eliminates blind code and all the reliability problems that plague conventional algorithmic software. In addition, it is ideally suited to the creation of highly stable and reusable plug-compatible software modules. Drag’m and drop’m. These easy to use, snap-together modules will encourage the use of a plug-and-play, trial-and-error approach to software construction and design. Rapid application development will never be the same. This is what Project COSA is all about. Unfortunately, a truly viable reactive system will have to await the development of single and multicore processors that are designed from the ground up to support the non-algorithmic software model. 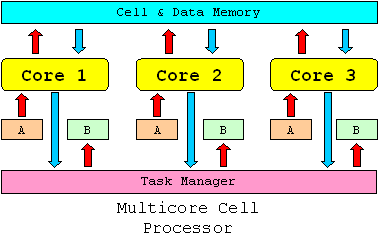 Hopefully, the current multicore programming crisis will force the processor industry to wake up and realize the folly of its ways. In my next article, I will explain why future computers will be non-algorithmic. A little over a year ago, D-Wave Systems, a Canadian company based in Burnaby, British Columbia, announced to the world that it had perfected a 16-qbit working prototype of a (supposedly) quantum computer. This January, D-Wave secured $17 million worth of financing from a Dublin based investment firm called International Investment and Underwriting (IIU). Did anybody say, sucker? Did I hear anybody say, snake oil? Does IIU really stand for ‘Idiotic Investment and Underwriting’? I am being facetious, of course. It’s my way of saying that anybody who invests in quantum computing is throwing money out the window. And by anybody, I don’t mean just private investors but public institutions as well. It does not bother me so much that private investors lose their money in QC (they’re in the risk business by choice) but, when I see government agencies like NIST wasting the taxpayer’s money on silly crackpottery, that bothers me. Quantum computing is the only “scientific” field that is not only based on zero evidence but the evidence, if it did exist, can never be observed by definition. The entire quantum computing field is based on the conjecture that certain quantum properties can have multiple states simultaneously, even though the property in question only has room for one. Worse, this property can never be observed in its superposed states because, as soon as you try to observe it, nature does some weird magic called the “collapse of the wave function” and the property instantly takes on one state or another. Amazing, isn’t it? Physicists get away with crap like this because they’ve managed to convince the lay public that it is too stupid to understand physics. This gem is straight from the so-called Copenhagen interpretation of quantum mechanics and Heisenberg’s uncertainty principle. The whole thing is so devoid of logic that Nobel Prize winner Erwin Schrödinger devised a now famous thought experiment (Schrödinger's cat) to illustrate the high strangeness, if not the outright crackpottery of quantum superposition. As Paul Feyerabend once wrote in 'Against Method', "the most stupid procedures and the most laughable results in their domain are surrounded with an aura of excellence". The questions that should be on everybody’s mind are the following: Do probabilistic processes necessarily imply superposition? Should one base a field of science on a mere conjecture or interpretation? The answer is no, of course. Consider that physicists are completely ignorant of the underlying reason that quantum interactions are probabilistic. And yet, in spite of this glaring lacuna in their understanding, they want an unsuspecting public to believe that they understand enough about the subject to be certain that superposition is a fact of nature as opposed to a mere interpretation. You don’t believe me? Go ask any physics professor to explain why the decay duration of subatomic particles is probabilistic. They have no clue, really. In view of the absence of evidence and of the incompleteness and inadequacy of their understanding, what makes quantum physicists so sure that superposition is a fact of nature? The answer is that they are not sure at all. Quantum computing is a field based on ignorance, arrogance and wishful thinking. Quantum computing is what I call voodoo science, the sort of field that is sure to attract all kinds of crackpots. Consider its most visible and most ardent promoter, Oxford physicist and professor David Deutsch. Deutsch is not only a quantum computing pioneer, he is also a strong supporter of the many-world interpretation of quantum mechanics. MWI is essentially an attempt by some to explain away the obvious silliness of state superposition by positing that the states exist in multiple universes. This is like borrowing from Peter to pay Paul, however. In other words, MWI proponents merely took away one unobservable outlandish conjecture, only to replace it with another equally unobservable and outlandish conjecture. This is what I call crackpottery in high places. MWI is obviously not anything that should be called science but David Deutsch is not known for being bothered by the Star-Trek quality of his physics. He relishes it. He is also a believer in the physical possibility of time travel (source: NOVA). He believes, along with Kip Thorne and Stephen Hawking that Einstein’s general theory of relativity does not forbid time travel. What is amazing is that, in his book, The Fabric of Reality, Deutsch writes about the famed philosopher of science, Sir Karl Popper, even though Popper once called spacetime, “Einstein’s block universe in which nothing ever happens” (From: Science: Conjectures and Refutations). What Sir Karl was pointing out is the fact (ignored by most physicists but a fact regardless) that nothing can move in spacetime, which means that the spacetime of relativity forbids time travel by definition. The point that I'm driving at is that David Deutsch is a crackpot, pure and simple; and it does not surprise me a bit that time travel crackpots like him would be attracted to Trekkie fairy tales like wormholes, parallel universes and quantum computing. As I promised in my last post, I was working on a short essay to explain why parallel systems should be reactive but then I got distracted by an article in MIT Technology Review about D-Wave’s exhorbitant claims and I got fired up to write about it. As seen above, I have very strong opinions about quantum computing: I think it is crackpottery at best and fraud at worst. I think that the frequent press announcements claiming progress in the field are pure BS, propaganda designed to secure government grants and attract gullible investors. I have excellent cause to believe that there is a very simple reason that quantum processes are probabilistic and it has nothing to do with superposition or any such silliness. I have written about this before. As always, I tell it like I see it. I guess it's just the rebel in me. Stay tuned.